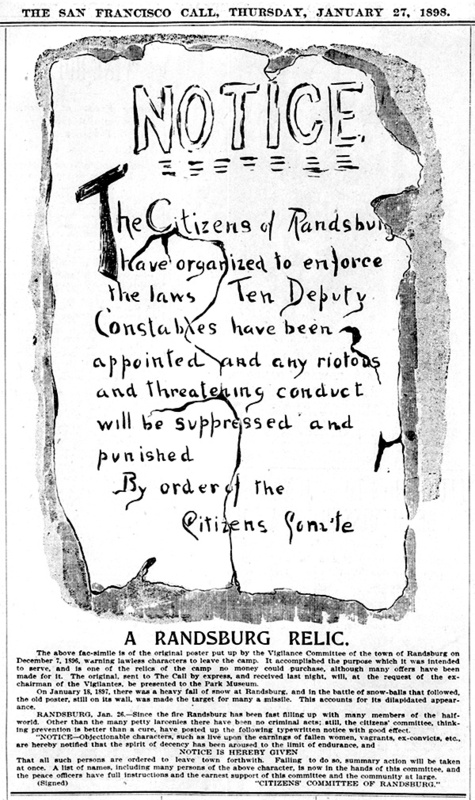 Dave Thompson became Constable of Randsburg upon the shooting death of John Arnold in 1907, during his seven years as Constable of Randsburg there were probably a number of these wanted posters sent out but this is the only one with his name on it that the museum has been able to locate. June 27, 1918: “HONEY AND TWO CLOSED EYES, BUT NO VANADIUM—Randsburg, June 27. – Two prospectors left Randsburg Friday, June 21, for Last Chance Canyon, Kern County, with fond hopes of locating a vanadium prospect. June 20, 1918: “DESERT YEGGS LOOT SAFE OF HI-GRADE ORE –Staging the second robbery in three weeks, a gang of bandits raided the Stringer district camps near Randsburg during the early morning hours, stealing a large quantity of high grade pin tungsten from the safe of Owen Clark and taking $65 in gold and some valuable papers from the mine of Valdamar Schmidt and escaping in the darkness. A posse was hurriedly formed this morning and a search of the surrounding country was started by the miners and farmers. It is almost certain that the bandits who operated last night were the same that stole the large safe of the King Solomon mine near Johannesburg a short time ago and escaped with several dollars in gold and valuable papers. A comparison of footprints near the scene of both robberies showed that they were exactly the same size. Word of the daring robbery spread around Randsburg and citizens as well as deputy sheriffs joined in the hunt. It is believed that the bandits are experienced men and of the hardest character. October 17, 1897: “PATRICK AND WILLIAM NEELAN were examined before Justice E. B. Maginnis on last Saturday and bound over to the superior court on a charge of grand larceny. On August 4th one of the clerks at W. C. Wilson’s store found the lock on the door of his powder magazine broken and pome of the powder gone. One day last week the above-named parties, through a third party, sold to W. L. Adams some powder. Upon the delivery of the powder the officers took charge of it and arrested the criminals.” – The Herald. 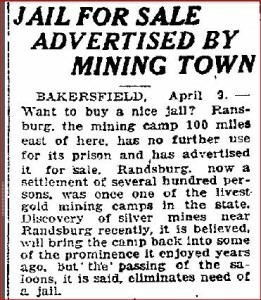 Advertisement For Sale of Randsburg Jail. Could the Constable not be doing his Job? September 19, 1919: “JIM SIERRAS WAS APPREHENDED at Randsburg yesterday by W. E. Snell, captain of the county’s traffic squad. He pleaded not to a charge of selling liquor in violation to Kern County’s “Little Volstead Act” in Justice Bunnell’s court. Judge Bunnel set September 22 as the date to set the trial. He fixed Sierras’ bail at $1000. October 18, 1923: “WELL SECLUDED STILL IS FOUND BY UNDER-SHERIFF SMITH NEAR MOJAVE — Early Wednesday morning C. H. Storey had completed one of the most promising and, he thought, well secluded mountain moonshine stills in the history of mountain manufacturing of inebriating spirits, bar none, according to Undersheriff Smith. “The long line of Tennessee and Kentucky moonshining familes had nothing on Storey’s booze factory, not did highly imaginative movie scenario writers and directors ever conceive a more melodramatic setting for a screen still than this latest contribution to the troubles of prohibition enforcement officers,” Stated Smith, this morning. “Storey had chosen a location in an old deserted mine in a ravine near Jawbone Canyon, at the deserted camp of Alpha mill, in the wild mountainous regions about 23 miles north of Mojave, he tunneled into the ravine and in his secret cave set up a very promising moonshine still, using a coal oil stove that caused Storey’s downfall, incidentally the destruction of his monument to illicit distilling enterprise and genius,” the officer stated. Undersheriff Charley Smith had business in Randsburg early in the week, and returning homeward, nearing the old Alpha mining camp his nasal organs refused to register normal. Whether it was an embryonic oil field, a burned over pine forest or a deserted mining town bar room he whiffed, Smith did not know. But he was determined to satiate his curiosity, and he did. Following the path suggested by his olfactory nerve, the officer was led into a nearby ravine, where he suddenly halted. The language he heard apparently floating from a greasewood bush on the side of the ravine, was more than even a hardened officer could stand without blushing. Curiosity finally overcoming his native modesty, Undersheriff Smith peered behind the swearing bush—and into a well-equipped still in the cave beyond. Storey was standing over the impromptu oil furnace emphatically and convincingly informing that oil stove just where such a “darn useless critter” should be consigned and how hot the flames when he arrived there. November 8, 1924: “OFFICERS IN SENSATIONAL COUP STRIKE SUPPLY ROAD—Five Arrested, Three Autos Seized, and $1300 Fines Are Collected—Two Counties Join In Desert Attack. Booze Route to Randsburg and Johannesburg Is Scene of Ambush. District Attorneys Henry E. Schmidt and George Johnson of Kern and San Bernardino counties made a bold slash at the booze artery which supplies Randsburg and Johannesburg, when they laid a cunning trap last night eight miles south of Mojave on the desert. Five Rum runners were captured; three cars were seized temporarily and $1300 in fines was collected in the dawn hours of this morning. The district attorneys of Kern and San Bernardino counties united forces and worked under the assumption that virtually the whole supply of illicit liquor trade of Johannesburg and Randsburg was organized in the southern counties and the booze shipped into the northern towns over this Mojave highway. Owing to the fact that “Number Six” the operator who had planned the trap under the direction of District Attorney Schmidt, was recognized, and that the trap was “tipped off” the arrests were less in number than anticipated and the “big runners” escaped, according to the officers. I. E. Boss, wine manufacturer, who lives outside of Mojave; C. J. Womack, of San Fernando; Charles Brownell, of Soledad canyon; H. C. Bruize, runner from Los Angeles and O. A. Finne also of Los Angeles. The operator leased a forlorn dwelling south of Mojave on the desert. The place was equipped as a gasoline and service station. The operator gave out that he was opening up a “regular joint” and cursed the Volstead Act. After a week or so, the “sample runners” of the southern booze traffic rings tentatively sounded out the new man and later provided samples of “wet goods” and quoted prices, delivered at the station. On the evening of Friday, the following men assembled at the home of District Attorney H. E. Schmidt; Assistant District Attorney Edward West, Deputy District Attorney Paul Garber, John Dowds investigator, and Officer Wiles, Webster, Rees, and Seibert. The assembled men left for Mojave in two big cars. A few miles south of Mojave, the machines were run off the highway into the high Joshuas whose spectral shadows were outlined in the cold, clear moonlight. FORCES JOINED—After a wait of an hour, a signal was flashed from an electric torch. The machines moved on and were concealed in the sagebrush behind the small, dark station. Later the forces of District Attorney Johnson were moved on in the scene of action with the same caution. Throughout the night and the following day the officers remained secreted in the dwelling. Early Friday morning Finne made his delivery of wine, ten gallons of it. Then throughout the following evening four others appeared, made their deliveries and were arrested by the waiting officers. Early Saturday morning the three seized cars were driven into Mojave. The prisoners were conveyed in the district attorney’s cars. Before Justice C. W. Townsend the men were summarily arraigned. Without exception and with good nature the men pled guilty, to two charges each, namely transportation and possession. The total fines amounted to $1300.